A presence at the Congress is your organisation’s opportunity to leverage two days of unparallel access to a wide potential client base, to inform them about your products and services and build long-term relationships. Exhibiting is a proven tactic for marketing your brand: it combines the reach of magazine advertising with the power of direct mail and persuasion of face-to-face meetings. Congress participants are keen to improve their knowledge. Aligning your organization with this powerful educational experience demonstrates your commitment to assisting their development at a deeply personal level. Your organization will benefit significantly from exposure to an interested, relevant and influential audience in an informal yet informative environment away from the competition of everyday distractions. Maximum exposure for your company and increased opportunities to access not only the registered delegates but anyone receiving Congress printed or electronic marketing information. Sponsors have a very important role to play in this international conference. Sponsors receive the acknowledgements specified below according to the corresponding levels of commitment. Please review the opportunities for sponsorship. Be sure to sign up as soon as possible so that your sponsorship can be announced on our website, in subsequent circulars, and in communications to a large community. 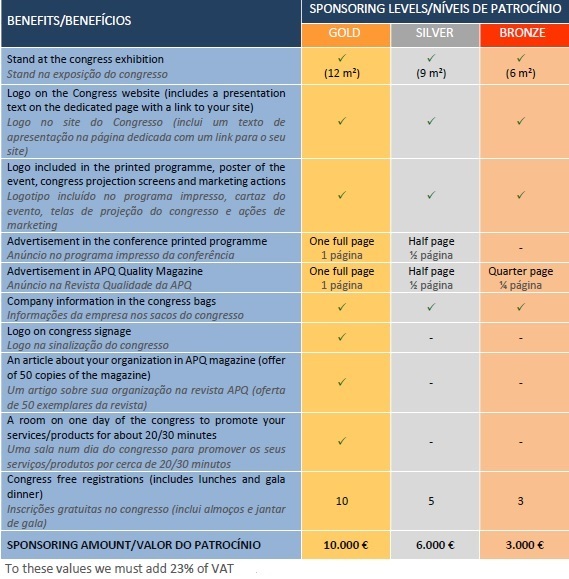 Your company can also participate in and sponsor various aspects/events of the vast programme that is being prepared for the participants of the EOQ Congress 2019. For more information, download here the full SPONSORSHIP MANUAL. Founded in 2007, Veeva NYSE (VEEV), is a leading global provider of cloud-based software solutions for vertical industries. At 2,600 employees and growing, Veeva was named among the top fastest growing public technology companies on Forbes’ annual Fast Tech 25 list. We help our customers eliminate inefficiencies so they can bring innovative, high quality products to market faster without compromising compliance. Veeva is headquartered in the San Francisco Bay Area, with offices throughout North America, Europe, Asia, and Latin America. Veeva was the gold sponsor of the EOQ in Paris in 2018 and an active board member of the AFQP (France Quality) and Kwinta (Belgium Quality). ACP Assistência, a company 100% owned by Automóvel Club de Portugal, provides a single and global travel assistance service, available 24 hours a day, 7 days a week, 365 days a year, to accompany, assist and advise our Members and Clients in any circumstances, in Portugal or abroad. ACP Assistência seeks to provide a service with high quality standards, in particular through its team of coordinators, drivers and mechanics of breakdown, highly specialized and with specific training in automotive technology, aiming at road repair in the first place. Our Quality System is one of the motors of the company and it is a precious tool on which we support our continuous internal operation and, consequently, the quality of the services we provide. APCER is a global entity that provides certification, auditing and training services. Our activity is based on four values ​​that we consider essential: competence, integrity, agility and commitment. Our mission is to build trust between people and organizations, improving management practices and contributing for a sustainable society. Our vision is to be a global partner to promote trust. Besides Portugal we are present in country´s like Brazil, Chile, China, Ecuador, Peru, Spain and portuguese speaking african countries. Our credibility is ensured by rigorous accreditation processes and international recognition. We care for the sustainability of people’s lifes. CATIM, is the Portuguese Technological center for the metal working industry is a non-profit private institution of public utility, that resulted from the association of interests, industries, and associations with public companies. Its mission is to contribute to innovation and competitiveness of national metal industries and similar or complementary sectors. CATIM aims to support the technical and technological development of the industry by service rendering, providing their knowledge and skills for initiatives in order to promote innovation and industrial competitiveness, and execution of the tasks inherent to the responsibilities assumed under the National Systems and European Standards, Qualification, Metrology and CE Marking. CERTIF – Associação para a Certificação is a national certification body, with the status of a private, nonprofit association of 27 Associates, between business associations and laboratories, representing several sectors of activity, among which the Social Organs of the Association are elected. CERTIF’s principles are independence, technical rigor and credibility as a means of safeguarding the impartiality and integrity of its work in the contact with the various entities with which it is related and ensuring the management of possible conflicts of interest. QAPP- Quality Appraisal is the innovative software solution provided by Quidgest to drastically increase efficiency when conducting audits, in particular audits simultaneously evaluating several quality standards. Quidgest has been a pioneer in the area of Artificial Intelligence applied to Digital Transformation for the past 30 years. 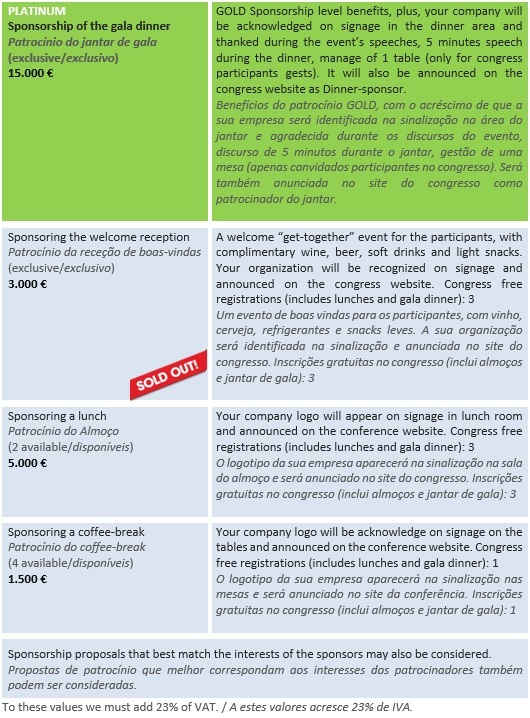 Quidgest is a proud sponsor of the 63rd European Congress of Quality 2019 in Lisbon. Since 1872, TÜV Rheinland has stood for the safety and quality of people, the environment and technology. Today, TÜV Rheinland a leading international service provision group acting in 69 countries on all continents. The group has a workforce more than 20.000 people, who generate revenue of more than €2 billion a year. In markets undergoing changes, TÜV Rheinland acts with profits at its heart and continuously works to increase its appeal to customers, partners and employees. We have a global reputation for our certification services and industry experience. We are at your side to improve your company’s quality and profitability by helping you standardize and optimize your quality management system. TÜV Rheinland Portugal was founded within the scope of Quality Management Systems Certification and Products Certification and operates in systems certification business with German accreditation by Deutsche Akkreditierungsstelle (DakkS) and local accreditation by Instituto Português de Acreditação (IPAC), Portuguese Institute for Accreditation.